David Kato Kisule (1964 – 2011) was a Ugandan activist for LGBT rights. He was murdered at his home in Kampala two weeks after winning a court case against a Ugandan tabloid that had repeatedly called for the execution of gay people. David qualified as a school teacher and had taught in various schools before being sacked in 1991 as a result of his sexual orientation. He moved to Johannesburg to teach until 1998 when, inspired by the progress on LGBT rights in South Africa, he chose to return to Uganda. He marked his return with a press conference at which he came out – becoming Uganda’s first openly gay man. An action for which he was promptly arrested and held in police custody for a week. He was one of the founding members of Sexual Minorities Uganda (SMUG) in 2004. As its advocacy officer he led the fight against what came to be known as the ‘Kill the Gays Bill’ in 2009. Kato and colleagues at SMUG spoke out against the politicians who wanted to introduce the death penalty for male homosexual acts, extending the already draconian sentences of 14 years imprisonment that had been inherited from British colonial laws. The activists were subsequently threatened with imprisonment or worse. David Kato took up a fellowship at the University of York’s Centre for Applied Human Rights in 2010 in order to gain some respite from the danger he faced in Uganda due to his visibility. He returned to Uganda the same year and, with colleagues, took on the newspaper that was fuelling further violence against gay people. David Kato’s murder caused widespread international outrage with Amnesty International, President Obama, and Rowan Williams, then Archbishop of Canterbury, speaking out against homophobia and violence in Uganda, and calling for reform. The David Kato Vision and Voice Award was established in 2011 in David’s memory. It seeks to ‘recognise the leadership of those who strive for the human rights of LGBTI people around the world‘ and continues to provide a platform for activists who are leading change in their countries. David Kato’s courage in the face of adversity and his will to live his truth are an inspiration to us. Like David Kato, we recognise the interconnectedness of our lives and the importance of understanding the struggle for LGBTQ rights as both local and global. We seek to learn from, network with, and offer fraternal support to Black gay/bi/SGL/queer men around the world. 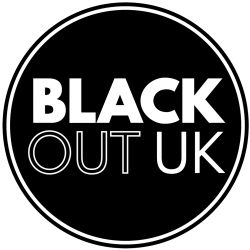 BlackOut is keen to build and cement connections with others who are organising among Black queer men across the diaspora. This summer we are working with European and US colleagues to convene spaces at the International AIDS Conference in Amsterdam for black queer HIV activists to gather, share learning, and build habits of solidarity. If you would like to work with us in building collaborative responses to the challenges we face, please do get in contact. These limited edition tees were so popular at Black Pride that we’ve nearly sold out. If enough of our readers who missed out would like one we’ll create some more – let us know by emailing blkoutuk@gmail.com with the size and colour that you’d like. Only £15. Event: Is being Black and Queer Bad for your health?